When a loved one passes away, this event often has far-reaching effects for the family members involved. Their grief already causes inner-turmoil, and this can translate into contention about how and when to handle the estate. While this is an already too-common situation, the problems become even more magnified if the deceased in question left affairs in terrible shape. Many older people suffer from decreased mobility, depression, and deteriorating mental capacity. As a result, their relatives may be shocked to discover that the once-nice home of the deceased has fallen into poor condition, even bordering on hoarding. From the emotional challenges of mourning to the unpleasant reality of estate settlement, what is the best approach to clean out a house after someone dies? At Clutter & Hoarding Pros, we understand the challenges that mourning families face when they encounter the unexpected condition of a deceased home. They feel like they have no idea where to start, and may even feel embarrassed, ashamed, or angered. When you clean out a house after death, you anticipate sorting through keepsakes and special memories, not sifting through piles of junk or trash. 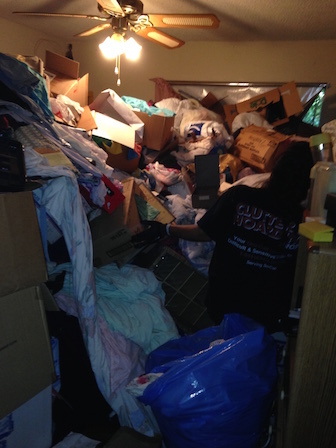 Our team knows that a dirty or hoarding-like environment can compound your grief, which is why we offer professional deceased estate cleaning services specifically tailored to your needs. Our caring, compassionate, and confidential approach focuses on reclaiming the property and any contents that are special to your family. Additionally, our remediation efforts help dispose of anything your family does not want, restoring the home to a livable or sellable condition. ​If your family is struggling with the condition of a deceased loved one’s home, we encourage you to contact us for a consultation. Let us show you why people across our community have trusted us to help them reclaim those memories and move toward a place where they can truly celebrate their loved ones’ legacies. led by compassionate, honest people that walk with you every step of the way, from cleaning out your loved ones estate to making excellent recommendations to qualified vendors who can repair the home and ready it for sale or rent.